I love Burt’s BeesProducts. LOVE LOVE LOVE them all!!! I have bought many of their products for myself and Sadie over the years but had not tried the Baby Bee Shampoo and Wash. It was wonderful. It is 98.03% Natural which I love as well. The all-in-one tear free wash combines a natural plant-based cleansing complex with sweet orange and lemon oils to create a nourishing formula that leaves your baby’s hair and skin silky soft. It even worked in Sadie’s hair which is much thicker than a baby. A nice lather and rinsed out squeaky clean…(I always listen for the squeak). 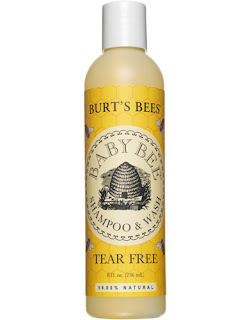 The featured ingredient in Baby Bee Shampoo & Wash is Coconut Oil which comes from the flesh. The flesh is rich in emollient fat and when pressed, yields a white, sweetly-scented, super-moisturizing oil. Its nice to only have to use one product instead of 2 for both hair and body. It was wonderful on Sadie’s skin as well. She has sensitive skin and there was no irritation at all. The I have used before for both Sadie and I. It is my favourite lotion to use on her. Not too thick but just thick enough to to the trick. It spreads nicely over her body and is gentle enough for her face as well. The lotion retails for $14.99 and the shampoo/wash for $9.99. Baby Bee has other baby products as well and some for mom and the rest of the family too. Visit them at www.burtsbees.ca Another 3 cheers for a Canadian company.